Syracuse University recently retained O’Brien & Gere to help develop a master plan that will transform the University’s steam station into a more modern and efficient plant. The SU steam station currently uses natural gas boilers to generate steam for its North Campus. 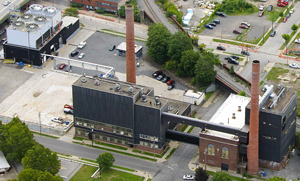 The plant also sells steam for heating to some neighboring businesses, including the SUNY College of Environmental Science and Forestry, Upstate Medical University, Crouse Hospital and the Syracuse VA Medical Center. In creating a state-of-the-art plant, SU wants to ensure the facility is also eco-friendly. Reducing greenhouse gas emissions continues to be a major focus of SU’s sustainability efforts. The steam station master plan ties in directly with SU’s Climate Action Plan, the University’s roadmap for becoming carbon neutral by 2040. As part of its work, O’Brien & Gere is conducting a comprehensive analysis of the current steam station and its systems and equipment. The firm will make recommendations regarding possible upgrades, with a specific focus on reducing the facility’s carbon footprint and incorporating renewable energy options. Lee Davis, president and COO at O’Brien & Gere, says the company is pleased to provide continued support to SU as it works to achieve its energy efficiency and sustainability goals. The company is currently examining SU’s steam station redevelopment options and creating a more detailed cost-benefit analysis that will soon be presented to the University’s Board of Trustees. O’Brien & Gere has a longstanding relationship with SU, helping to develop the University’s Climate Action Plan released in 2009. The employee-owned engineering and project delivery company has more than 850 scientists, engineers, construction and operations personnel located in 30 offices across the United States. With a 65-year history of applying technology and innovation, O’Brien & Gere is a leader in providing energy, water, environmental and facility solutions for its public- and private-sector clients.